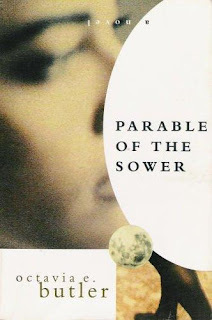 To put it plainly: I enjoyed Parable of the Sower. It was a tense, edgy book about a woman in the future struggling to survive in a world of chaos. Our heroine, Lauren Olamina, is a black woman born with a psychological disorder known as hyperempathy, which causes her to literally feel the pain she sees others in. While strictly in her mind, it causes her to become incapacitated all too often in a world where pain is everywhere. I don't know how she managed to not become a timid mouse of a person, but she'll go down fighting - she'll stab you, even if it feels to her like she's stabbed herself. She rises up where others would have backed down, and I don't know where she gets the strength to do it but it's a compelling aspect of her character. Olamina narrates her story through her journal, where she records her thoughts, conversations, and events that happen around her. For some time, she has known that she doesn't believe in God the way others do. To her, god is change. In her poetry, we find she believes that nobody can resist god, god is indifferent, yet god can be guided and used if a person can figure out how. The trick is to learn how to accept and direct the changes that inevitably happen. Later, she names her belief Earthseed. She sees the big picture: that mankind must eventually leave the earth if it is to survive. Thus, our common destiny is to literally be the seeds of earth as we spread life throughout the universe. Otherwise, all life must eventually die out, leaving our ultimate purpose unfulfilled. While her beliefs about adjusting to change and taking control of our lives are useful to her, the Earthseed aspect of it is just a far-off dream with no impact on the story. Our narrator sees the decline of society all around her. She plans ahead, and makes a survival pack that can be grabbed in a moment and taken with her. Eventually, when her walled neighborhood is hit hard, with their houses burning and the denizens being shot, she makes it out into the unforgiving street with one goal: to head north to where there is more water, and hopefully a job. The street is just as bad as you can imagine, but she knows how to shoot and she has a few fellow neighbors which travel with her. Her foresight has left her better off than most. As they go, her group swells in size, and they eventually start learning from Olamina about her dream/philosophy of Earthseed. She becomes a messiah of sorts, and even though her group has mixed reactions to her ideas, they realize that they have a much better chance of surviving together than as individuals. I'm not going to give it away more than that. Personally, I wasn't interested in the narrator's philosophy, which essentially renames change as God. I understand how it is important to try to shape our own destinies, but the story didn't need the new religion. It didn't need anything, since the setting is so gritty and mesmerizing. The hyperempathy is likewise unnecessary - it is a diverting idea, but since the main character has learned to work around it so well, the overall effect on the story seems to amount to nothing. As far as style goes, the story is mostly written in short, trim sentences. It comes across much more like a tale told in first person than as a person writing in their journal, which is fine because it was more gripping that way. In an actual journal, there would have been tons of stuff irrelevant to the story, conversations would be summarized rather than quoted, and a lot of details would have been left out since the author wouldn't have needed to explain things so much to herself. (Here I'd add a comparison to the Diary of Anne Frank, if I'd ever read it...) On the plus side, it's better as an imperfect journal because it's a more entertaining read. I loved the apocalyptic vision in the Parable of the Sower. It's disturbing but provocative to see just how far mankind might go to survive in a world of limited resources. I found it very hard to put the book down. It kept my stomach in knots but I had to know how Olamina was going to stay alive when things were so dangerous. The book outlines a worst-case scenario, but it echoes some of my own fears for our country and our civilization. There will be desperate times, where shortages of water, food, or gas could cause a collapse of society. Like any responsible, paranoid adult, I think about what would happen if I were in that type of world. I have to admit, I would probably die quickly. As creepy as this book is, though, it is oddly reassuring. It shows us that with the proper preparation, people could still survive. It shows us that amidst all the bad, there will always be good as well. In fact, as dark as it was, I would still call it an optimistic book. I'm glad I read it, and I have high hopes for the sequel, Parable of the Talents. Wow, this sounds incredibly fascinating. I might actually add this one to my list to read, Byron! Would you classify it as a dystopian novel? If so, do you want to add 'dystopian' to your labels--it'd probably be a good label to have around. Her hyperempathy sort of reminds me of what Marcia was saying in Ella Enchanted, how the main character was cursed by having to obey everything. Olamina also has something she can't control in her, something that's a blessing or a curse (question - does her hyperempathy work with the good as well as the bad? If someone gets a relaxing massage, does she feel that as well?). Anyway, I don't know how I'd deal with hyperempathy either, but then again, I don't know how I'd deal with living in an iron lung or something, either, you know? People adapt, and I imagine it's fascinating to read about someone adapting to a condition which doesn't actually exist because it lets you relate, in some ways, to people who have to adapt to conditions which DO exist. Or maybe I'm just babbling. I just woke up. Anyway, this book review fascinated me. Well, after researching the term "dystopian," I would say that, yes, it is. If I needed any further proof, to find it on a Wikipedia list of dystopian literature removed all doubt. However, I'd say that in the Wikipedia article on dystopia, there is typically a strong oppressive entity, such as a government or greedy corporation. In the book, it is the very absence of a dominating presence, the lack of control, that is so devestating. While corporations and gangs do exert a lot of influence, the main character is only affected indirectly by their aims. You are spot on in your guess that her hyperempathy also helps her to feel pleasure. In the novel, it is usually sexually derived pleasure, whether from her own partner, or in another case, members of her group trying to enjoy themselves in a confined area, thinking she is asleep. Although in that case, I believe it might be breaking the "have to see it to feel it rule". Your intuition works amazingly well in the morning. Must be nice. I'd have been asking, "What's them word things sayin'? Huh, it's about a book. Eh, too long. ZZZZ"
I always kind of like end-of-the-world scenarios in books and movies. They're scary in a way because I always think "This could actually happen." That's why I've joined a militia and built an underground bunker.